Building a train table doesn’t have to be a difficult or expensive proposition, but I realized this week I’ve never talked about how to go about doing it. Here’s how to build a simple, inexpensive train table. I built my tables in an evening with a knowledgeable friend helping me, at a time when I knew little or nothing about tools and hardware. With the plans I’ll outline, someone with little or no knowledge could replicate those efforts in a couple of hours with no more tools than a saw, a drill, and a vehicle large enough to haul the materials. Costs will vary, but this 4×8 table I’m describing would cost about $32 to build, using materials from your nearest home improvement center. If you’re lucky enough to live near a locally owned lumberyard, you could source materials from there as well, and probably get better quality. Regarding material selection, OSB costs about 50% less than plywood but plywood will give a better appearance. If you are covering the table with scenery, you probably won’t see the OSB. You’ll get a stronger table if you step up to a 3/4″ table top but I find a half inch is generally sufficient. When you shop, check the cull lumber section. If you find suitable lumber there, or something close enough to let you improvise, you can save a fortune. From the 2×3 boards, cut three to a length of 3 feet, 9 inches. Cut six more to a length of 4 feet, or shorter if you want a shorter table. If you don’t have a saw, you can have the store cut the boards when you buy them. 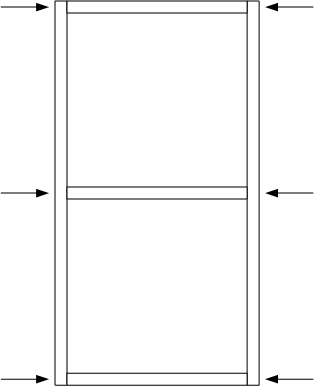 Build a frame from the two remaining 8′ boards and the 3’9″ boards, with the short side facing up. 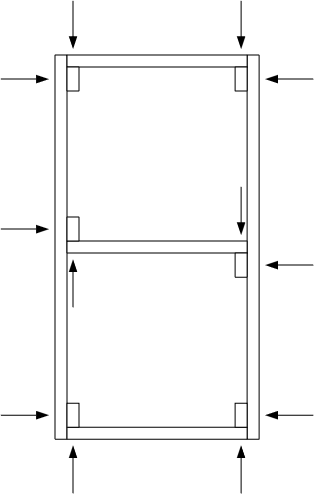 Secure the boards with two screws where indicated with arrows in the drawing below. Drill pilot holes with a 1/8″ drill bit before driving the screws to make it easier. Next, place a leg in each corner where indicated in the drawing below. Secure each leg with two screws. If a leg is too wobbly, add a third screw. Again, drill pilot holes to make driving the screws easier. Flip the table up, then place the sheet of plywood or OSB on top. Secure it to the frame with a screw in each corner. Add screws at the center of each side to hold the top of the table flat. If desired, paint the table to give it a finished appearance. At this point the table is done, ready for you to add scenery and track. You can build as many tables as you like and have room for, and place them side by side.